I have a pain in my short leg, usually pain travel around my upper leg. had 3 visits with osteopath. he adjust my pelvis by manipulation, but unfortunately didn't work for long. After last visit he said, he is disappointed. well me too. Did he give you exercises to do at home? If not most chronic problems associated with the lower back will relapse. See our Lower back exercises page. If the pain travels "around" your upper leg, then I would also be looking at the mid to upper lumbar spine. 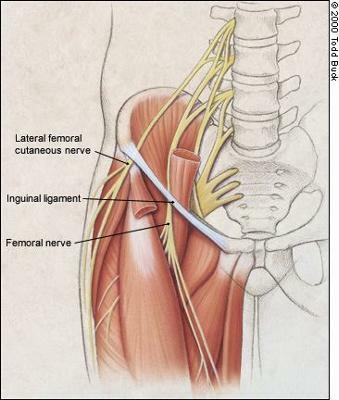 The Femoral nerve supplies this area. If he didn't examine and treat your spine as well as the pelvis, then no, you wouldn't get much relief. Deciding how thick the shoe lift shoe be, and whether it should be placed under the heel or the whole foot is a complex subject. But vital in many short leg syndrome cases. Perhaps print this out, and take it to your osteopath.